We've always lived on a dangerous planet, but its disasters aren't what they used to be. How the World Breaks gives us a breathtaking new view of crisis and recovery on the unstable landscapes of the Earth's hazard zones. Father and son authors Stan and Paul Cox take us to the explosive fire fronts of overheated Australia, the future lost city of Miami, the fights over whether and how to fortify New York City in the wake of Sandy, the Indonesian mud volcano triggered by natural gas drilling, and other communities that are reimagining their lives after quakes, superstorms, tornadoes, and landslides. In the very decade when we should be rushing to heal the atmosphere and address the enormous inequalities of risk, a strange idea has taken hold of global disaster policy: resilience. Its proponents say that threatened communities must simply learn the art of resilience, adapt to risk, and thereby survive. This doctrine obscures the human hand in creating disasters and requires the planet's most beleaguered people to absorb the rush of floodwaters and the crush of landslides, freeing the world economy to go on undisturbed. 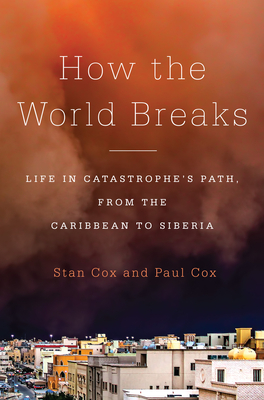 The Coxes' great contribution is to pull the disaster debate out of the realm of theory and into the muck and ash of the world's broken places. There we learn that change is more than mere adaptation and life is more than mere survival. Ultimately, How the World Breaks reveals why--unless we address the social, ecological, and economic roots of disaster--millions more people every year will find themselves spiraling into misery. It is essential reading for our time. Stan Cox is research coordinator at the Land Institute in Salina, Kansas, where he lives. His books include "Losing Our Cool" and "Any Way You Slice It" (both published by The New Press). Paul Cox is an anthropologist and a writer on development and disaster. He is based in Copenhagen, Denmark, and regularly conducts research in Central Africa.